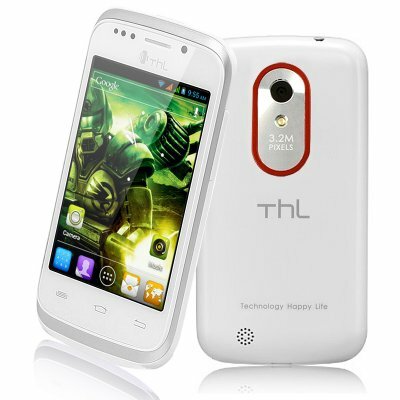 Successfully Added Dual SIM Android 4.0 Phone "ThL A1" - 3.5 Inch Screen, 1GHz CPU (White) to your Shopping Cart. Branded ThL A1 Android 4.0 Phone with a 3.5 Inch screen and 1Ghz CPU, combining power and portability with a great design from a trusted brand name. With more than 10 years of experience in manufacturing great android phones, ThL has built a wide customer base in both Europe and the United Stated. As a great mid-range phone, the thL A1 Android 4.0 phone packs some very solid specs, including a 1GHz CPU. Use the Micro SD slot to expand the memory up to 32GB and snap a quick picture using the 3MP camera. The ThL A1 has the perfect size to easily fit in your pocket with its 3.5 Inch screen but still offers a great way to watch your favorite movies. Download any of the 600.000 apps offered in the Google Play store and rest assured that the A1 will run any app at a great speed. Offered to you at a great price, the ThL A1 features great specs and a fantastic design. In stock now, we guarantee to ship out your order the next day and offer you a 12 months warranty. Brought to you by the leader in wholesale Android Phones, Chinavasion. Excellent product, easy to handle I came fast, I am very satisfied with this and with Chinavasion, are supoer!